The size of marker affects visibility. Larger markers stand out in the camera view and can be tracked at longer distances, but they are less suitable for tracking fine movements or small objects. In contrast, smaller markers are beneficial for precise tracking (e.g. facial tracking and microvolume tracking), but have difficulty being tracked at long distances or in restricted settings and are more likely to be occluded during capture. Choose appropriate marker sizes to optimize the tracking for different applications. If you wish to track non-spherical retroreflective surfaces, lower the Circularity value in 2D object filter in the application settings. 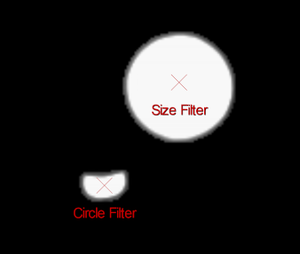 This adjusts the circle filter threshold and non-circular reflections can also be considered as markers. However, keep in mind that this will lower the filtering threshold for extraneous reflections as well. If you wish to track non-spherical retroreflective surfaces, lower the Circularity value from the cameras tab in the application settings. All markers need to have a well-maintained retroreflective surface. Every marker must satisfy the brightness Threshold defined from the camera properties to be recognized in Motive. Worn markers with damaged retroreflective surfaces will appear to a dimmer image in the camera view, and the tracking may be limited.